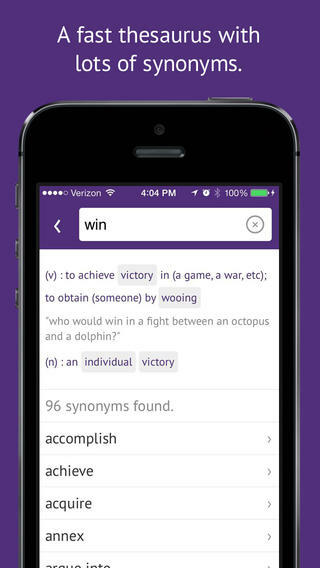 Thesaurasize offers a quick way to look up synonyms for traditional and nontraditional words of the English language. The initial list of synonyms and the definitions came from the Wiktionary. The Princeton WordNet dictionary was also searched. So how does it work? Just type in a word and Thesaurasize generates a “clickable” list of synonyms with their definitions. The app also provides examples for many of the entries. Highlighted words within definitions can also be “clicked” for their definitions. Click your way to a better word choice today by using Thesaurasize. And… it’s FREE! !